I've seen this product which is supposed to be a powder that small animals can use to bathe in & can also be used as a bedding. I can't remember the brand but it comes in a white plastic bottle. It claims to be a powder which clumps together when wet. The manufacturer says all one has to do is remove these clumps & the rest of the powder is dry & can be re-used. I have no idea what's in this bedding but my advice is to avoid any bedding which clumps. Doesn't matter whether its made from clay, silica gel or any other chemical. As long as it clumps when wet & is not made from organic or natural products, it should be avoided. Read the section on "Cat litter" to understand why. Even if you use a lot of hay or straw to cover clumping bedding, it still poses a threat 'cos cavies dig & can reach it! Likely to contain chemicals that are toxic! If ingested will form clumps inside cavy! Will need operation to remove! Only organic clumping litter is safe. 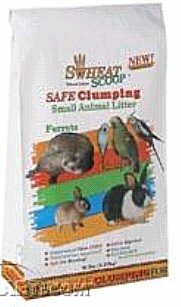 A good example is Swheat Scoop Clumping Small Animal Litter. It forms wheat starch clumps which when wet, becomes hard as they sit so it's easy to scoop out these hard clumps. It is naturally clumping and doesn't contain any chemicals like traditional clumping litters do. Unfortunately its not sold in Singapore.